Weather phenomena are capable catching people off-guard when seemingly normal events turn into something never before seen or expected. Sometimes the weather events are not witnessed first-hand and instead people find evidence of the happening well after the fact. One prime example of this is the process of vitrification, or creation of a glass crust on objects. Vitrification is a phenomenon evident in deserts around the world, often believed to result from an intense blast of heat capable of melting sand and rocks to create glass-infused crust. Usually these types of blasts are attributed to meteor explosions just above the Earth's surface, given the right circumstances, although any such blast has not been observed first-hand. 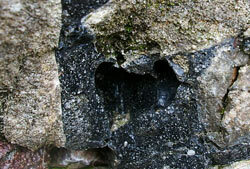 Vitrified glass can be the result of lightning striking sandy areas to create fulgurite root-shaped tube deposits of fused silica quartz, a very different looking vitrification when compared to vast areas encrusted in layers of glass. Reports of ball lightning or plasma balls have trickled in over the years that could possibly be a means of creating vitrified glass. Plasma balls are usually described as a sphere-shaped bright object streaking horizontal across the sky which can range from a dull quiet vanish to a very loud explosion. Some researchers now theorize large areas of desert glass might be connected with ancient atomic testing or wars, and contest the invention of such devices might have happened well before the modern age. There are references to nuclear type events in ancient texts like the Mahabharata, which describes large explosive events with precision similar to the modern age descriptions of a nuclear event. The texts reference billowing smoke clouds, shock-waves, flames, and vitrified glass surfaces. However, melted glass surfaces are evident in more areas than the desert, lending credence to the possibility of ancient atomic wars. Vitrification has also been discovered in ancient cities such as Catal Huyukin in the Province of Piaui, various forts in England, Babylonia, Death Valley, Arabia, Gobi, Mohave Desert, Norway, Canary Islands, and the list continues without sufficient scientific explanation in most cases. A handful of researchers believe the ancient Scottish, English and Irish forts were possibly intentionally vitrified as a means of strengthening the fortifications, but they find problems with feasibility and resource allocation to achieve this type of castle defense. There are also quite a few solid stone structures similar to the forts that appear to be melted in some way with no reasonable scientific explanation. Pointing toward ancient atomic war does explain certain results such as glass crusting, but unfortunately there is not enough tangible evidence to support these claims. Even if, remotely, the vitrified forts and deserts were byproducts of meteor explosions in our atmosphere, why have they never been witnessed and why do we not have historical accounts of this but instead of mass destruction type events? The vitrification process requires very high temperatures to turn outer layers of rock and sand into a smooth glass. Areas of vitrified desert are explained to be the result of a meteor explosion over the area, creating intense heat in the process. A similar result was achieved during the detonation of the atomic bomb, demonstrating an idea of the type of power required to vitrify parts of the Earth's crust. Forts in Scotland, France, and Turkey clearly show evidence of vitrification, but the answers to how remains in question. Estimations suggest that for these forts to reach vitrification by human involvement, temperatures in excess of 1,000 degrees Celsius are necessary. Theories claim the forts were deliberately used as large kilns in order to strengthen them from attackers. The process would be long, tedious, and very impractical. Other theories suggest these forts might be victims of an ancient atomic war.